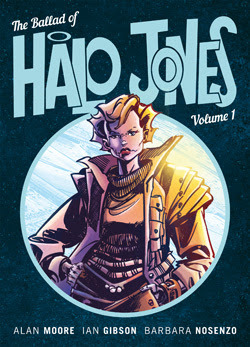 The first true feminist character in British comics, Alan Moore and Ian Gibon’s space opera Halo Jones has been lovingly coloured for the very first time in a new three-volume series. With the first volume on sale in May, the expertly remastered artwork has been coloured by breakout talent Barbara Nosenzo for a brand-new prestige format series collecting the utterly compelling and groundbreakingly ambitious classic. Despite inspiring countless readers over almost four decades, this new series aims to introduce Halo to a new generation who will be enthralled by this down-to-earth ‘everywoman’ and the extraordinary tale of her life. Bored, frustrated and unemployed, Halo yearns to escape for a better life away from ‘The Hoop’, the 50th-century housing estate floating off the island of Manhatten. Pledging to escape on a fantastic voyage, she sets in motion unimaginable events that will send shockwaves throughout her life – a spell on a luxury space-liner, a brush with an interstellar war. Halo will face hardship and adventure in the name of freedom in a limitless cosmos. This galaxy-spanning story – comics’ first bona fide feminist space opera – was the first true epic from one of the greatest comic book writers of all time, which can easily sit alongside Watchmen and V for Vendetta.